Here’s the single biggest reason to buy Bank of America’s stock today. Whenever I look at Bank of America (NYSE:BAC), I can't help but think that it's stock is bound to surge one of these days. It may not be next week or next month, but the time will come. And when it does, only investors who get in before then will benefit from it. Its shares are just too cheap. Indeed, for enterprising investors, that's the best thing about Bank of America's stock right now. Bank of America isn't the cheapest big bank stock, trading as it does for a 32% discount to book value, but it's close. That unenviable honor goes instead to Citigroup (NYSE:C), which trades for a 34% discount to book value. There is no set rule about what a bank stock should trade for in relation to book value. When times are good, shares of banks will be priced at two or more times book value. But when times are bad, as in a recession, then banks will trade for less than book value. Given this, to gauge how cheap or expensive a specific bank is, you need to compare it to other banks. And in this case, Bank of America looks pretty darn cheap. 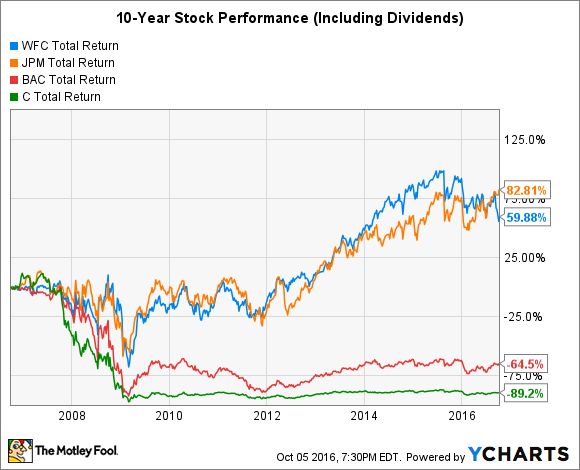 I say that because the average stock on the KBW Bank Index, which tracks two dozen large-cap bank stocks, is priced at 20% above book value. There are reasons that Bank of America, as well as Citigroup for that matter, are priced so low. In the first case, as global systemically important banks, they face a heavier regulatory and compliance burden. Compared to their smaller, simpler peers in the regional banking space, Bank of America and Citigroup have to hold more capital, operate with less liquidity, undergo annual stress tests administered by the Federal Reserve, and defer to regulators' veto power over big bank dividend policies. All of these things weigh on their ability to maximize shareholder return. WFC Total Return Price data by YCharts. In addition, rarely before have banks operated in such a challenging environment -- the only exception over the past eight decades that I know of was during the 1980s, when thousands of banks and savings and loans failed. The main culprit currently are ultralow interest rates, which compress banks' lending margins. Mortgage rates, for instance, are half their long-term average of 8%, meaning that banks generate much less revenue from them than they used to. If rates rose by only 100 basis points, or 1 percentage point, then Bank of America's net interest income would grow by $7.5 billion. That's a lot of money and it'd go a long way toward helping Bank of America's stock trade once again for a premium to book value. Always remember that your objective is to buy low and sell high. And you can't buy low unless something is weighing on the market or a particular stock. In sum, if you're an enterprising investor looking for a lucrative long-term hold, though nothing is guaranteed, then I'd encourage you to check out Bank of America. The best thing about its stock right now is that it's incredibly cheap.